Rakusan did not include the Fan Series in his main sequence numbering. Therefore, the original number used for each of the 36 Series prints has been modified to identify the Fan Series members of its theme. The five different fan silhouette shapes have been here assigned arbitrary numbers 1 through 5. To indicate a fan design these shape designations are added to the 36 Series number separated by a hyphen. 127-4 is the Fan Series design with fan shape 4 in the 127 Shrimp and Clam theme. Like all other designs in this series, 127-4 was only produced in a single print run, and few copies are currently documented. The 127 Shrimp and Clam theme is one of the many entirely regular themes represented by a complete fan quintet and a color woodblock print. On the delivery folio for installment eight of the Fan Series in November 1934, Rakusan announced shrimp and clam designs as due to appear in installment nine in the following month, December 1934. However, it is not known if installment nine was actually distributed in that month or was delayed. 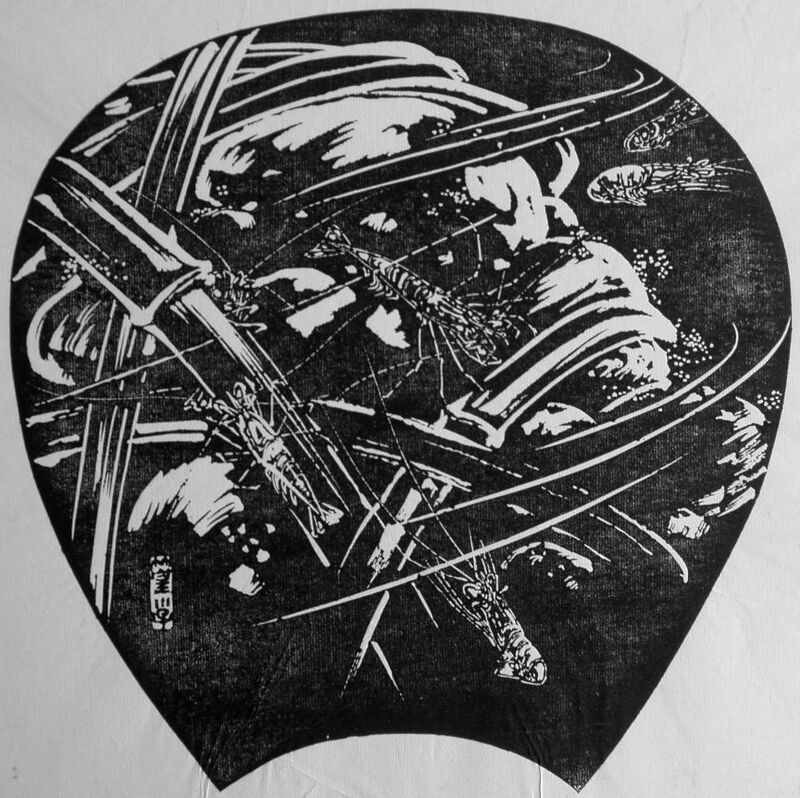 The woodblock prints were printed during the same month as their distribution, and the 36 Series design 127 would have appeared at the same time. Three of the five fan designs (including 127-4) have seal C which indicates a carving date during the first half of 1934. Despite the early completion of those wooden blocks, Rakusan delayed printing and distribution of the prints in what became the 127 Shrimp and Clam theme at least for several months. It was eventually grouped with other winter season themes nearer to the end of the series. One fan design (127-3) has seal R which is a rare minor seal whose carving period has yet to be established. The remaining fan design (127-5) and the 36 Series design 127 both have seal B which indicates a later carving period closer to the time of publication. 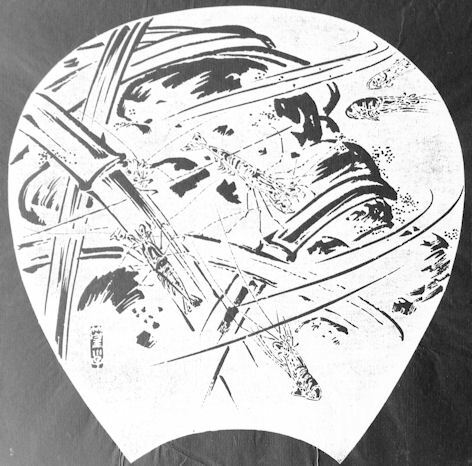 Rakusan announced the title of theme 127 as 鰕に蛤, ebi ni hamaguri, loosely 'shrimp and clams'; and this original title is also used here as the theme name. The Japanese name 蝦, (also written 海老, 蛯, 螧, えび, エビ), ebi, is a general name for all lobsters, prawns, shrimp, and crayfish; but the meaning does not include crabs. There is no English name with equivalent scope. For convenience only, here 蝦, ebi, is translated as 'shrimp' because that is the historical meaning of that kanji, but its usage is actually more general. All of the animal life shown in the 127 Shrimp and Clam theme are sold in food markets. Rakusan could easily have obtained models in Kyoto and eaten them for dinner afterward. At least some of the mollusk designs in this theme could have been adapted from sketches originally created in the late 1920s during the planning of design 40 in the earlier 100 Series (see below). The composition of 127-4 includes six small freshwater shrimp in different poses. The shrimp are clustered around a loosely sketched gabion (蛇籠, jakago, lit. 'snake-basket'), an erosion control method in which stones are contained in some sort of cage framework. Here the medium-sized stones are loosely bound into a cylindrical basket openly woven with wide bamboo strips. Several very abstract curving lines superimposed on the elements indicate that the shrimp are alive and swimming in the water. Sand or mud next to and on the gabion are indicated by clusters of small dots. All of the elements are essentially line drawings which look equally well in the ishizuri version or in the original sketch. The small freshwater shrimp is probably Lake Prawn, Palaemon paucidens, 条蝦, 筋蝦, スジエビ, suji-ebi, lit. 'striped shrimp', is an edible species found locally near Kyoto, especially in Lake Biwa. The same variety of shrimp is shown in 108-5 and 125-1.